The singer/songwriter posted the visual clip for “Pretend” – featuring A$AP Rocky – to her official Vevo page on Monday (September 30, 2014). “Pretend” – which was co-written by Lyrica Anderson and produced by Noel “Detail” Fisher – is now available for download via iTunes. Video treatment for “Pretend” was handled by Jodeb, whose resume includes works for Zedd (“Find You”), Porter Robinson (“Lionhearted”), Sebastien Ingrosso (“Reload”) and Anberlin (“Unstable”). As previously reported, Tinashe’s highly-anticipated LP “Aquarius” will be released on October 7 via Sony Music Entertainment / RCA Records. Album contributors include Stargate (Beyonce, Keyshia Cole), Boi-1da (Drake, Kelly Rowland), DJ Mustard (Fergie, Trey Songz), Mike WiLL Made It (Usher, LeToya Luckett) and Devonte Hynes (Jessie Ware, FKA Twigs). Tinashe has previewed her debut album online. The singer/songwriter – born Tinashe Jorgensen Kachingwe – will release “Aquarius” on October 7 via Sony Music Entertainment / RCA Records. Current single “Pretend” – co-written by Lyrica Anderson and produced by Noel “Detail” Fisher – is now available for download via iTunes. The A$AP Rocky-assisted track follows previous single “2 On,” which peaked at number twenty four on the US Billboard Hot 100 Singles Chart. Other musicians backing Tinashe on “Aquarius” are Stargate (Usher, Nicole Scherzinger), Mozella (Tessanne Chin, Mary Lambert), Devonte Hynes (FKA twigs, Jessie Ware) and Boi-1da (Drake, Kelly Rowland). Listen to the official “Aquarius” sampler below. Tinashe has debuted a new song online. The singer/songwriter posted the audio clip for “Feels Like Vegas” to her official SoundCloud page on Monday (September 15, 2014). The track was co-written by Mozella, whose credits include Miley Cyrus’ “Wrecking Ball” [RCA Records], Tessanne Chin’s “Tumbling Down” [Republic Records] and Pixie Lott’s “Bang” [Virgin EMI Records]. Production duties on “Feels Like Vegas” were handled by Stargate, who are also responsible for Iggy Azalea’s “Black Widow” f/ Rita Ora [Island Records] and Maroon 5’s “Leaving California” [222 Records / Interscope Records]. Tinashe’s current single “Pretend” – which features A$AP Rocky – is now available for download via iTunes and all other digital outlets. Her highly-anticipated debut album “Aquarius” is scheduled for release on October 7 via Sony Music Entertainment / RCA Records. Listen to “Feels Like Vegas” below. Tinashe has revealed the official artwork for her upcoming debut album online. The singer/songwriter is scheduled to release “Aquarius” on October 7 via Sony Music Entertainment / RCA Records. 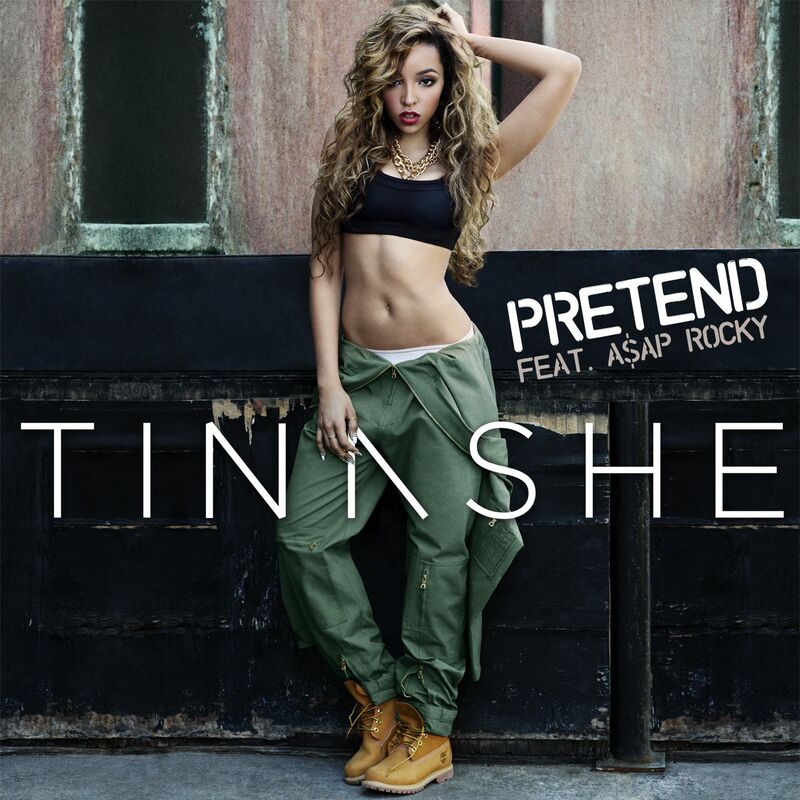 Current single “Pretend” – written by Tinashe along with Lyrica Anderson and Noel “Detail” Fisher – is now available for download via iTunes. The A$AP Rocky-assisted track serves as the follow-up to previous single “2 On,” which peaked at number 24 on the US Hot 100 Singles Chart. Other album contributors include Stargate (Kiesza, Charli XCX), DJ Mustard (Trey Songz, Mila J), Jasper Cameron (Ciara, Mario Barrett), Boi-1da (Drake, Chris Brown) and Mike WiLL Made It (Usher, Mariah Carey). Elle Varner has graced Jessie J’s upcoming third album. The R&B singer/songwriter co-wrote “Personal” for Jessie J along with Jenna Andrews and William “IDap” Larsen. The track will appear on Jessie J’s next studio collection, “Sweet Talker,” out on October 13 via Lava Records / Republic Records. Other songwriting credits by Varner include Miguel’s “Use Me” [RCA Records] and Tanika’s “Runaway” [Tim & Danny Music / Capitol Records]. Her sophomore studio collection, “Four Letter Word,” is expected to be released later this year via Sony Music Entertainment / RCA Records. Current single “Don’t Wanna Dance” – which features A$AP Rocky – is now available for download via iTunes and all other digital outlets. “Four Letter Word” serves as the follow-up to 2012’s “Perfectly Imperfect,” which debuted at number four on the US Billboard 200 Albums Chart. The highly-anticipated LP will be executively produced by Jeff Robinson, who is also overseeing the next projects by Daisha [Epic], Gabi Wilson [RCA], Justine Skye [Atlantic] and Tiara Thomas [Interscope]. Listen to “Don’t Wanna Dance” below. Tinashe has unwrapped the official tracklisting for her upcoming debut album. The singer/songwriter – born Tinashe Kachingwe – is scheduled to release “Aquarius” on October 7 via Sony Music Entertainment / RCA Records. Current single “Pretend” – which features A$AP Rocky – is now available for download via iTunes and all other digital outlets. The track was co-written by Lyrica Anderson, whose credits include Jennifer Hudson’s “Walk it Out” [RCA Records], Beyonce’s “Drunk in Love” [Columbia Records] and Elijah Blake’s “X.O.X” [Def Jam Recordings]. Production duties were handled by Noel “Detail” Fisher, who is also responsible for Jennifer Lopez’s “I Luh Ya Papi” [Capitol Records], Wiz Khalifa’s “We Dem Boyz” [Atlantic Records] and Kelly Rowland’s “Ice” [Republic Records]. Other musicians backing Tinashe on “Aquarius” are DJ Mustard (Trey Songz, Charli XCX), Clams Casino (Mikky Ekko, Pia Mia), Boi-1da (Drake, Nicole Scherzinger) and Devonte Hynes (FKA Twigs, Kylie Minogue). Peep the tracklisting for “Aquarius” below.